I pulled out the 2012 data on the % of employees who are represented by labor unions for each state. Note I'm discussing the % of workers who are represented by unions and the % of people who are actually members of unions differs some. I sorted the states into groups with : under 5%, 5% to 10%, 10% to 15%, 15% to 20% and over 20%. 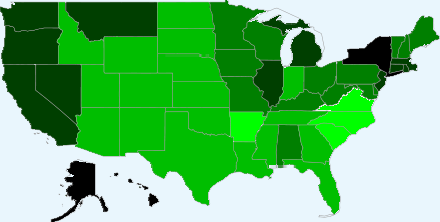 The light green states are low union states and the dark green/black states are >20%. I'm not particularly surprised by any of these with maybe the exception of Alaska being so high. I would guess that the higher union rate in Alaska is at least partially due to relatively high number of government jobs there. For more specifics on Union membership and representation see the BLS news report.